Dominick L. Holman, 49, passed away on April 2, 2019 at his home in Montgomery, Texas. He was born July 3, 1969 in Houston, Texas to Richard and Shirley Holman. Dominick is survived by his wife of 20 years, Laura Earhart Holman; son, Trey Holman; daughters, Danielle Holman, Donice Danko, Brianna Danko and his “Forever Lil Buddy” grandson, Rustin Levi; brother, Salvatore Holman and wife Lesley; sister, Richelle Taylor, limited aunts and uncles, numerous cousins, nieces, and nephews. He is proceeded in death by his father Richard Holman, Sr.; mother, Shirley Richhart, two half- brothers, Rick and Harry and step mother. 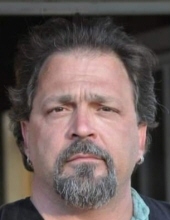 Dominick spent 20 years as a Licensed Fire Alarm and Safety Field Service Installation Technician. He had numerous interests in life along with lots of collections, loved Mechanics, Barbequing, and Firework parties twice a year. He rode motorcycles, participated in The Texas Renaissance Fares and recently became a farmer handyman. Dominick loved kids and seemed to be part animal whisperer. He is a Lifetime resident of Houston, Texas. After school, he joined the United States Navy in 1989 as Aviation Support and Handling Mechanic. After 2 years of sea service, including one active deployment in Desert Storm, Dominick retired from the Navy in December of 1992, becoming a lifetime member of the Veterans of Foreign Wars Post #9187 of Texas. In lieu of flowers we are asking for donations in remembrance of Dominick Lucien Holman, please visit our Tribute Store. Or, please visit Dominick's Tribute Fund. To send flowers or a remembrance gift to the family of Dominick Lucien Holman, please visit our Tribute Store. Or, if you would like to donate to the family, please visit Dominick's Tribute Fund. Please dress casual and comfortable! Guaranteed delivery before Dominick's celebration of life begins. Help ease the financial burden placed on the Holman Family after the loss of a loved one by making a donation. "Email Address" would like to share the life celebration of Dominick Lucien Holman. Click on the "link" to go to share a favorite memory or leave a condolence message for the family. Provide comfort by sending fresh flowers from our local florist or donating to Dominick's Tribute Fund.